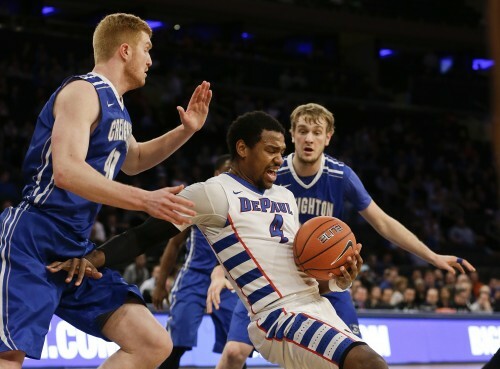 NEW YORK — For a half of basketball, anyway, DePaul men’s basketball seemed to correct the problems that plagued them for the last half of the season. The shot selection was good, passes were crisp and they even managed to hold their ground in rebounding. But in the end, they were the same old Blue Demons. Bad habits doomed DePaul in the first round of the Big East tournament Wednesday as the No. 7-seed Blue Demons fell 78-63 to No. 10-seed Creighton at Madison Square Garden. A second half unraveling marked the third straight season where DePaul (12-20, 6-12 Big East) finished with at least 20 losses. Creighton (14-18, 4-14 Big East) made its mark with an 8-0 run midway through the second half, which saw the Blue Demons go just over three minutes without scoring. The scoring draught was nothing new for DePaul as it was a common problem for the Blue Demons during the eight game losing streak to end the season. As Purnell referenced, rebounding was also a big problem. The Bluejays finished with a 35-28 edge, but it marked the bigger problem that Creighton bullied DePaul on the inside. Creighton took a mind-numbing 30 free throw attempts and drilled in 32 points in the paint. The Bluejays led by as many 17, taking a 72-56 lead with3:22 left. Creighton’s screening game was very effective and DePaul had to pick their poison — failing to guard the screener who was open for a jump shot or the man driving. During that mark, DePaul guard Billy Garrett Jr. said he noticed his teammates starting to feel down about themselves. Garrett was one of the few positives for DePaul. Garrett, who had been in a shooting slump for almost a month, finished with 10 points and a game-high eight assists. Forwards Myke Henry and Tommy Hamilton, two players who have also had inconsistent seasons, shined as well. Henry scored 10 and grabbed nine rebounds while Hamilton had 11 points and six rebounds. Senior Jamee Crockett led the Blue Demons with 15 points. The Blue Demons trailed at the half 35-33, but had started the game much stronger. The offense looked like it did earlier in the season with an inside-out attack with the Blue Demons getting to the rim. DePaul even took the lead early in the second half, going up 39-38 in the first two minutes from a Crockett jumper. The two teams traded the lead back-and-forth before careless DePaul mistakes caused Creighton to get the upper hand. And as Creighton’s lead grew, the miscommunication on offense and defense for the Blue Demons was apparent. Hamilton missed Crockett on an outlet pass on the fast break, hitting the referee’s shoe and turning it over. Seven of DePaul’s 11 turnovers came after halftime. Creighton shot 48 percent from the field to DePaul’s 44. James Milliken led his team with 22 points, often being the shooter that DePaul left wide open off screens. The Bluejays will advance to face No. 2 seed Georgetown Thursday at 7 p.m. While Creighton adapted, the reality set in for DePaul that another season is over.